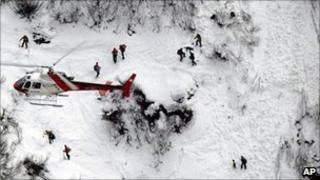 Four people have been killed, another is missing and five more have been injured following an avalanche in southern Switzerland. They were members of a group - made up of French nationals - which had been skiing and snow-shoe hiking in Valais, near the Italian border. A major operation involving several helicopters began after one man managed to free himself and alert rescuers. The avalanche risk in the region at the time was "considerable and rising". The 11-strong group was on a high-altitude tour close to the Great St Bernard Pass when it was swept away by a snow slide. The BBC's Imogen Foulkes in Bern says the route is one of the most spectacular and challenging in the Alps. The members of the group were carrying avalanche transceivers but they did not have a guide. Six of the party were pulled alive from the snow but one died later in hospital.